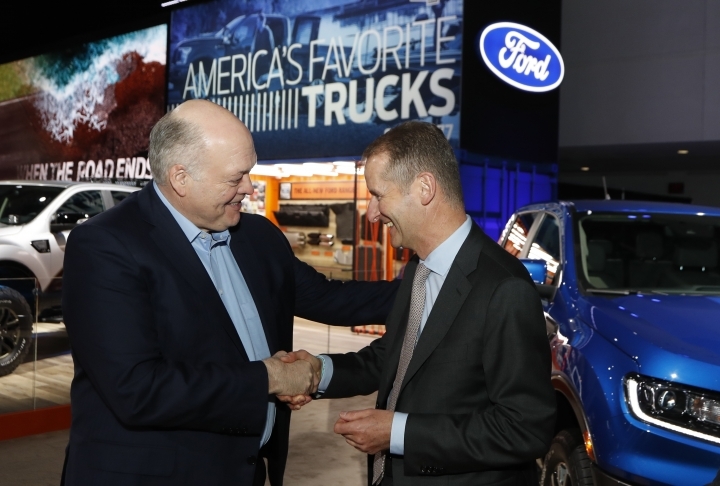 FRANKFURT, Germany — Volkswagen and Ford are forming a global alliance to develop commercial vans and medium-sized pickups together while exploring broader cooperation on future battery-powered and autonomous vehicles and services. Volkswagen CEO Herbert Diess and Ford CEO Jim Hackett said Tuesday that the first jointly developed vehicles could hit the market as early as 2022 and that the linkup would offer efficiencies that would mean stronger profits starting 2023. The deal is the latest in a string of alliances across the industry as carmakers face the need to keep up with new technologies and invest billions in research and development. They are under pressure from governments in key markets such as the European Union and China to come up with electric vehicles so they can meet tougher pollution limits. And they are racing with tech companies such as Waymo and Uber to develop autonomous vehicles and to find ways to offer temporary use of an auto as a service through smartphone apps. Hackett said the alliance "will not only drive significant efficiencies and help both companies improve their fitness, but also gives us the opportunity to collaborate on shaping the next era of mobility." He said in a conference call with reporters that the rush of new technologies is broad and "moving at the speed of light." "You can't do this alone," he said. Jessica Caldwell, executive director of industry analysis at car shopping website Edmunds, said that the success of the partnership "could ultimately determine the long-term fate of two of the world's most iconic brands." "Automakers aren't just competing with each other anymore, they're under intense pressure from well-funded tech companies who are eager to get in on the future of mobility," she said. "Cutting costs by sharing vehicle architectures and manufacturing facilities is just table stakes in this new world, and is a nice place to start. However, the key to success will be if Ford and VW can help each other fend off the upstarts and become leading forces in electric and autonomous vehicle technology." Because of the huge costs involved, automakers, ride-hailing companies and tech firms have announced numerous partnerships. Fiat Chrysler is providing minivans to Google's Waymo autonomous vehicle unit, while General Motors and Honda, Uber and Toyota and Lyft and parts supplier Magna International are teaming up on self-driving cars. Cooperating with an American company also makes sense for Volkswagen - which is based in Wolfsburg, Germany, and owns the Volkswagen, Porsche, Audi, Skoda and other brands - because the regulatory conditions for preparing the start of widespread autonomous driving are more advanced in the U.S. than in Europe.